On a beautiful Saturday afternoon, my family and I took advantage of our Orange County location and headed off for lunch at Downtown Disney. As huge fans of Disney World’s dining offerings, we continue to look for restaurants here at the Disneyland Resort that are in the same class as those in Orlando. Unsure of where to go, we checked out the menus on wdwinfo.com and decided to head to Ralph Brennan’s Jazz Kitchen. We had visited the quick service side before, but we had never eaten in the full service restaurant until now. 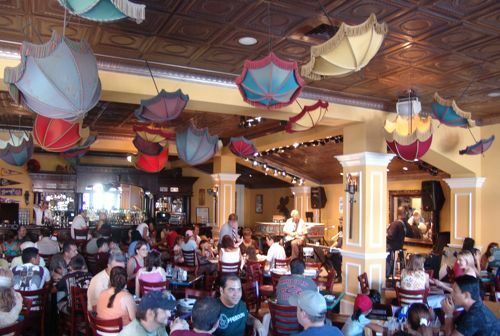 Ralph Brennan’s is nationally renowned for having great New Orleans style Cajun and Creole cuisine with restaurants in the French Quarter, Houston, and Las Vegas. We had heard so many great things about Ralph Brennan’s and had high expectations for for our meal. 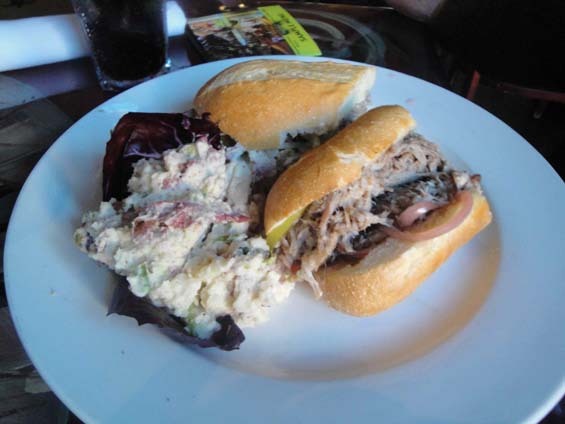 We ordered the Cochon De Lait Po-Boy (marinated pork, red onions, creole mustard) with a side of bacon-jalapeno potato salad, a trio of soups (gumbo, crawfish tomato bisque, and creole onion), and the Louisiana Crab Cakes. 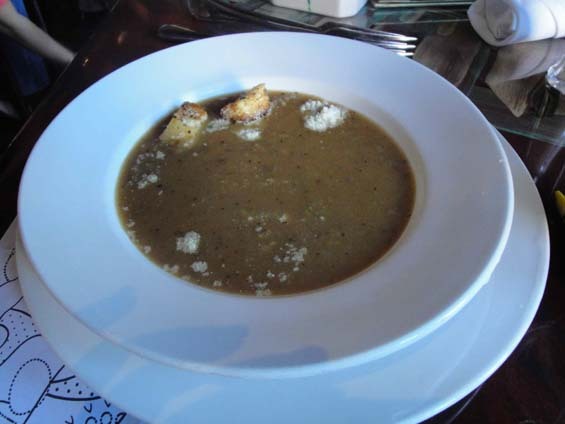 The soups were warm, but we expected them to be hot. The service was adequate, but we expected it to be excellent. The food was good, but we expected it to be great. 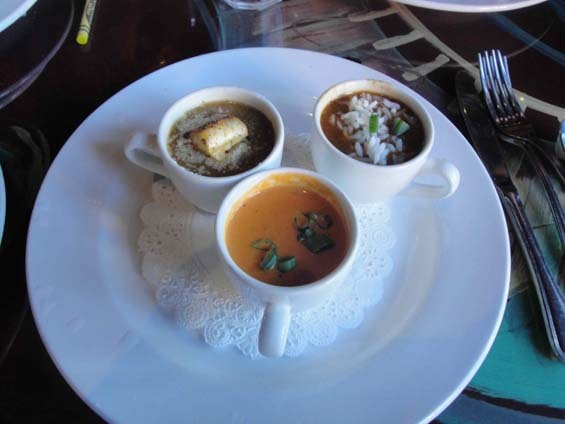 We all shared each others’ food, and voted the Po-Boy in first place, with the tomato crawfish bisque earning the silver medal. Granted, everything tasted fine, but a Ralph Brennan’s restaurant implies outstanding food. In our opinion the food was good, but outstanding it was not. Before deciding to share our meal, we did look at the kid’s menu for our eight-year old son. They offer the usual kid’s meal stuff. 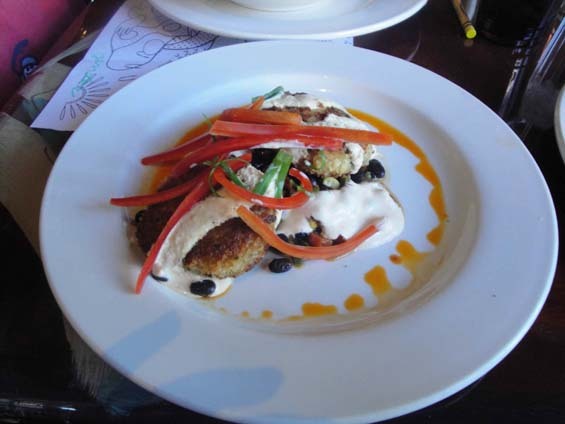 Included is an appetizer of two celery and two carrot sticks with ranch dressing, an entree, a choice of sides, and a dessert. The two 4-6 year old girls next to us ordered the kid’s meal, which was huge (except for the “appetizer”). The entrees were adult size. As good spies, we noticed neither of the girls made a dent in their meals. One kid’s meal is more than enough to feed two children under the age of ten. (Of course I have no idea how much your kids eat, so if they are training for the Nathan’s Hot Dog Eating Contest, never mind.). Finally, the price is $9.95. I personally think this is way too much for a kid’s meal, but it is the right price for the amount of food you get. If you split it, then it is actually a good deal. I have to be honest, there was one outstanding, amazing, wonderful, scrumptious part of our meal which I will tell you about now. The Banana-Coconut Creme Pie was incredible. I am not a fan of pie in general. Normally when dessert rolls around, I find the chocolate or the cobbler-type goodies. This pie “takes the cake.” It was the best thing I have eaten anywhere in Disneyland! I would and will go back just for this pie. And at $6.95, I would have paid $10.00 if I knew it was going to taste so good. Now where is the picture? Being the star of our meal, did the pie not want to be photographed by the gawking paparazzi? Truthfully, no. In reality, we inhaled it so fast we forgot to take the picture. If you want to see it in its full glory, you will need to order a slice yourself. Sorry. Lunch prices range from $10 to $15 per sandwich or entree while dinner ranges between $18 and $35 per entree. Sides are included with both. Currently, they are offering a three-course for thirty dollars prix fixe menu. Those who have trouble with mildly spicy food should keep in mind that most dishes have a kick. 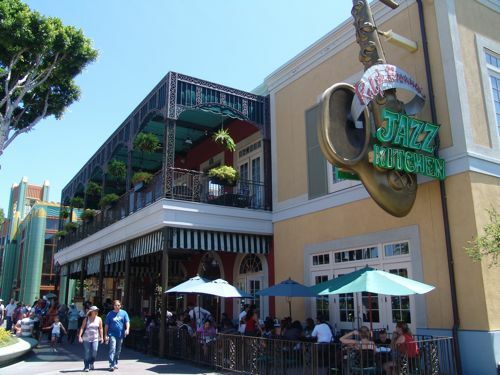 Live jazz music is performed nightly beginning at 7 pm. If this restaurant was in WDW, I wouldn’t be getting up at 6 am on day 180 to make sure I get my ADR. But if you want a table service meal that is of higher quality than what you find inside the parks for about the same cost, then go to Ralph Brennan’s Jazz Kitchen in Downtown Disney…Of course, you could always just order dessert!